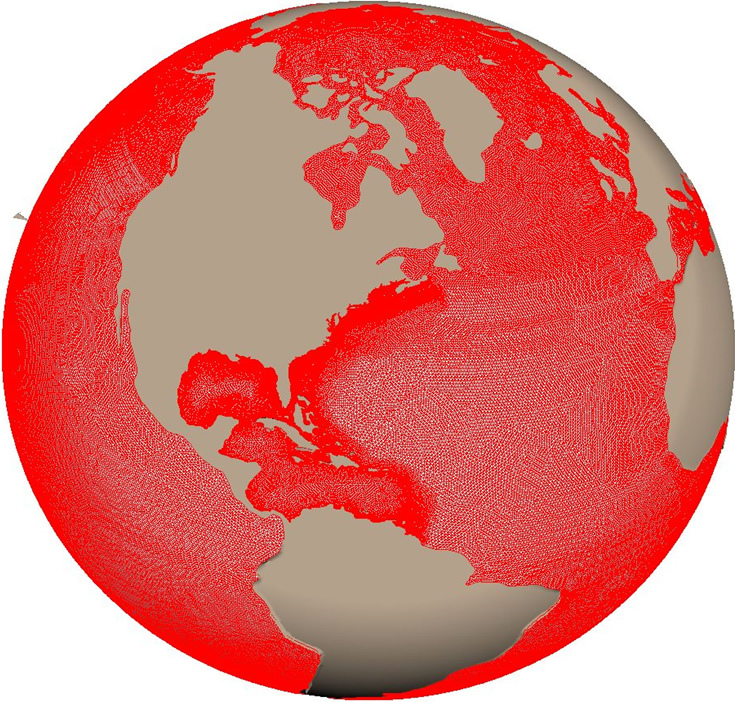 Global-FVCOM uses the spherical version of FVCOM and covers the entire global ocean with inclusion of all major rivers. Its grid features a horizontal resolution of 5 km (in the coastal region of the Gulf of Maine/Georges Bank, ~10 km over the Mid-and South Atlantic Bight shelves, and up to ~2 km in the Arctic Ocean. The hybrid coordinate is used in the vertical, with a total 45 layers, 10 and 5 uniform layers near the surface and bottom in the region deeper than 225 m with a transfer to the sigma-coordinate in the shallow continental and coastal regions. The thickness of the uniform layer is 5 m, so the hybrid coordinate transition occurs at the location where all layers have uniform thickness of 5 m. This hybrid coordinate allow us to avoid numerical errors in the simulation of surface mixed layer and bottom boundary layer dynamics in the interior without losing vertical resolution in the shallower coastal regions. The bathymetric data were taken from two sources: the sub-Arctic region (up to 72o N) is represented by depths from the 2-minute Naval Oceanographic Office Digital Bathymetric Data Base–Variable resolution (DBDBV) version 4.3 and the central Arctic bathymetry was obtained from the International Bathymetric Chart of the Arctic Ocean (IBCAO), a digital database that contains all available bathymetric data north of 64oN. These two data sets match very well in the overlapping region between 64oN and 72oN. The vertical maximum depth is 5500 m and the minimum depth at the coast is 5 m.
Global-FVCOM is fully coupled with UG-CICE (Gao et al., 2011). Global-FVCOM is driven by a) astronomical tidal forcing with eight constituents (M2, S2, N2, K2, K1, P1, O1 and Q1), b) surface wind stress, c) net heat flux at the surface plus shortwave irradiance in the water column, d) surface air pressure gradients, e) precipitation (P) minus evaporation (E) and f) river discharges. The model includes 406 river inputs around the coast. River discharge along the US and Canada coast is specified by the daily climatologic mean from USGS monitoring sites (http://www.usgs.gov and www.ec.gc.ca), while all other discharge data are provided by L. Smedstad, NCOM Group. Global-FVCOM is solved using the semi-implicit scheme with a time step of 600 sec. With MPI a one-year model run with inclusion of SST and SSH data assimilations takes a 24 computational hours.